“No greater tragedy exists in modern civilization than the aged, worn-out worker who after a life of ceaseless effort and useful productivity must look forward for his declining years to a poorhouse. A modern social consciousness demands a more humane and efficient arrangement." In 1935, President Roosevelt signed the Social Security Act. The aim was to help those in need of financial assistance, and over the decades the legislation has kept millions of Americans afloat—particularly older people and the disabled. Without the aid of programs, like Social Security Disability Insurance (SSDI) and Supplemental Security Income (SSI), multitudes of people would needlessly suffer. Even those who are not struggling with a disability rely heavily on Social Security, benefits that people can begin to collect at 62-years of age. Social Security is used in reference to the federal Old-Age, Survivors, and Disability Insurance (OASDI) program, according to the Social Security Administration (SSA). Whether you work for a company, or are self-employed, some of the taxes you pay every year go towards social security. Funds that can be drawn from later in life, when one’s ability to work or desire to work diminishes. While Social Security benefits can greatly help, it is important to keep in mind that such benefits only replace approximately 40 percent of pre-retirement earnings. If you would like to be involved, all you have to do is follow USA.gov and Social Security on Facebook. At Driscoll Law, we are committed to helping you get the social security benefits you require. 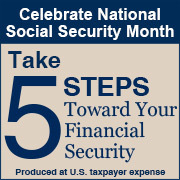 We would like to ask our readers to take some time this month to observe the first National Social Security Month, and have an active role in your financial security which we all rely heavily on in our golden years.